Ready, set, build! The UTEX 2-in-1 Construction Play Table features a top surface that offer a construction surface on one side and smooth surface on the other. One side of the reversible play board is compatible with LEGO® or DUPLO® blocks, giving kids a fun space to build their very own creations. 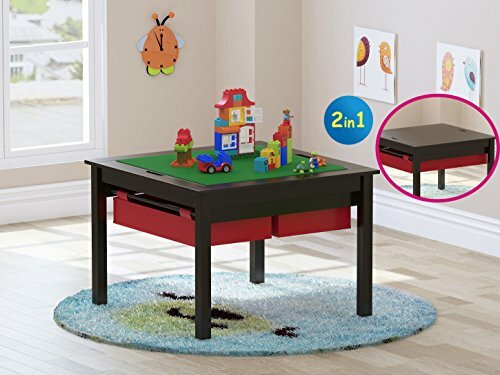 The other side is a smooth surface perfect for train sets, action figures and other toys, this convertible table supports a variety of activities. Plus, the elegant finish looks great with an array of décor styles. When it's time to pack up, the storage area is beneath the surface make it easy to keep your play area neat and tidy. • This durable table with wooden legs can handle vigorous play. ASSEMBLED DIMENSION: 25.6 "W X 25.6"L X 21"H (Taller Version). This Lego Table is sized right for toddlers and kids aged 3+. Its height is conveniently sized for young children, making it easy for them to access the table while either kneeling or sitting on the floor. TWO CONVIENIENT STORAGES: When it's time to pack up the building blocks, take them away to the drawers. With all your blocks nearby, it's easy to start building all over again. BEST GIFT: This sturdy wooden Lego table is a perfect gift for any occasion. Ideal for block play, arts&crafts, dollhouses, puzzles. If you have any questions about this product by Utex, contact us by completing and submitting the form below. If you are looking for a specif part number, please include it with your message.